Is parking free at Braintree Village? 6 hours FREE car parking is available for all Braintree Village shoppers with 1,500 car spaces and 10 coach bays. Braintree Village shoppers who intend to use the car park for more than 6 hours, will need to extend their free parking by visiting the Tourist Information Centre to validate their car registration to avoid a penalty charge. Where can I get further information on the stores? Each store at Braintree Village has its own individual page which you can access by visiting our stores page. You will find a telephone number and unit number for the respective store on their dedicated page so that you can contact them directly with any queries. Where can I get a map of the centre? 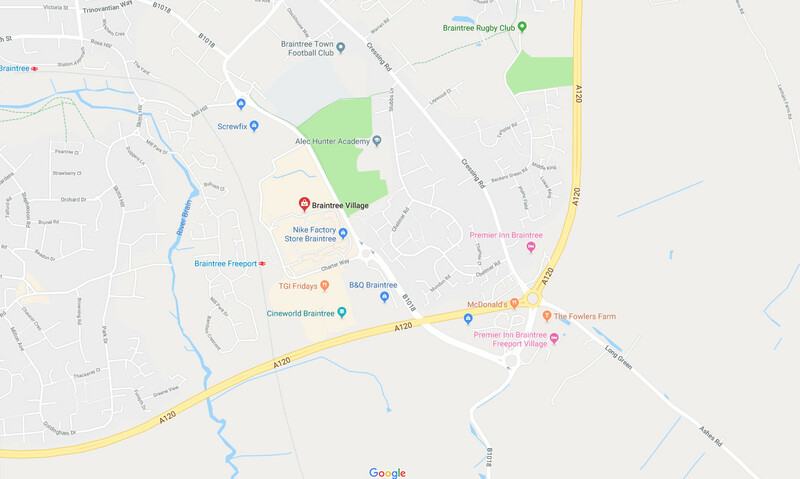 If you want to see the whole of Braintree Village online then please take a look at our online map. You will be able to locate the stores you want to see upon your visit and can also download a copy of the map that you can carry around with you during your shopping. Where do I find information on special opening times at Christmas and Easter? We open our doors at Braintree Village every day except Christmas Day. When is late night shopping? All guide dogs, hearing dogs and assistance dog are permitted at the Outlet. Check with individual stores for their own specific guidelines on dogs.